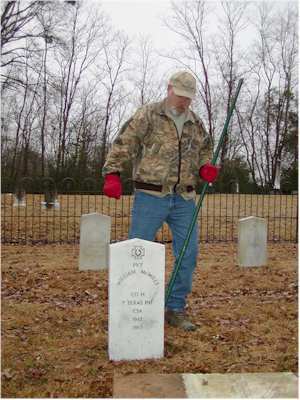 On January 31, 2003, William McMills, 7th Texas Infantry, was memorialized at the Raymond Confederate Cemetery with a headstone bearing his name and regiment. 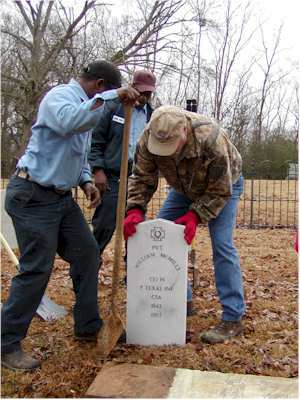 McMills was one of the 41 members of the 7th Texas Infantry who was killed May 12, 1863, during the Battle of Raymond. 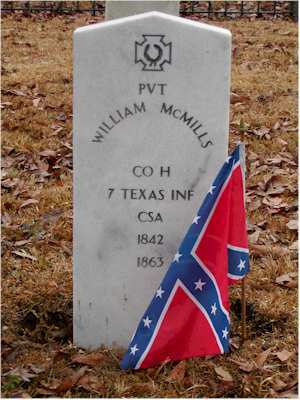 As with the other 7th Texas soldiers memorialized on the hillside in Raymond’s Confederate Cemetery, little is known of William McMills. He is remembered only for his bravery as a young soldier and for his dedication to the Confederate Cause. McMills was born in Tennessee in 1842 but later moved to Harrison County in east Texas. McMills was only 18 years old when he and his twin brother, John, traveled to Marshall, Texas, to enlist in the 7th Texas Infantry under the command of Colonel John Gregg, a lawyer from Fairfield, Texas. In October of 1861, after weeks and weeks of drilling, the 7th Texas left for war. Young McMills soon discovered that life in the Confederate army would not be an easy one. He was sent to Hopkinsville, Kentucky, where many of the men died of measles and pneumonia before ever setting foot on a battlefield. The ice and snow of winter made their living conditions unbearable. Real disaster stuck on February 15, 1862, when Fort Donelson, a Confederate stronghold on the Cumberland River, was forced to surrender to the enemy. Over 12,000 Confederate soldiers were taken as prisoners and sent to Johnson’s Island located in the midst of Lake Erie. The soldiers never forgot the rigors of prison life and vowed never to return. During the first two years of the war, especially while in prison, many of the soldiers died from starvation and disease. Others literally froze to death. Southerners were not conditioned to endure such hostile winters. William McMills was one of the soldiers to survive the odds. In September of 1862, as the soldiers were exchanged, the 20-year old returned to southern soil. Arriving in Vicksburg, the soldiers appeared broken in health but high in spirits. They had lived to return to their beloved South and were ready to continue the fight for the cause they held so dear. However, the 7th Texas Regiment, once boasting 749 men, had been reduced to less than 500 in number. Many had used illness and injury as a reason to receive honorable discharges and return to Texas. William Mills was not among them. He had signed the pledge For Three Years or the War, and he intended to keep his promise. He would follow the course of the war, no matter where it led. After the exchange, he was sent to Port Hudson, Louisiana, then on May 12th, 1863, ordered to Raymond where Gregg’s Brigade was commanded to intercept the enemy. Forty-one soldiers from the 7th Texas, including William McMills, perished that day as a result of the battle. A number of others were listed as captured, wounded, or missing. That night, when Granbury called the roll, it became apparent that the 7th Texas had sustained a high number of casualties when forty-one men failed to answer roll call. McMills was one of the voices that had been silenced. There was no going back to search the battlefield for the missing, dead, and wounded. The Union army had set up picket lines, occupying the town of Raymond. In the meantime, Gregg’s Brigade had received orders to march for Jackson and was forced to press on immediately. The ‘fallen’ from the Battle of Raymond were left to the perils of the battlefield. The family of William McMills never heard from their son after the Battle of Raymond. It was as if the waters of Fourteen-Mile Creek had swallowed him into its depths. He simply vanished into eternity. *The identity of Pvt. William McMills was discovered by Rebecca Drake while researching the 7th Texas. Edward J. Lanham, Historian and Researcher, Brooks, Georgia, placed the headstone. Copyright (c) James and Rebecca Drake, 2003. All Rights Reserved.